A third of banks in Scotland have closed since 2010, new analysis has found - raising fresh concerns about people's access to cash. Consumer group Which? found 610 banks and building societies closed between 2010 and 2018, with the total number dropping from 1,625 to 1,015. The watchdog said "urgent regulatory action" was needed. It came as MPs on the Scottish Affairs Committee met in Westminster on Tuesday to discuss access to cash. They were due to hear from Which?, Citizens Advice and Scottish Rural Action on the impact the branch closures are having on communities and businesses across Scotland. Gareth Shaw, head of money at Which?, said: "These ongoing closures could have a huge impact on communities across Scotland, stripping millions of people reliant on cash of their ability to go about their daily lives. "Cash is also a vital backup when digital systems fail - so the UK government must appoint a regulator to oversee these changes and ensure no-one is shut out from paying for local goods and services." 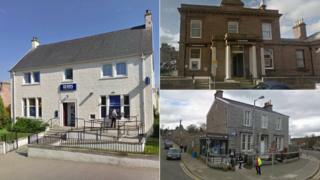 The research found Edinburgh south-west had the most bank closures, cutting the network by 135 branches down to a total of 30. Glasgow Central came second, having lost 70, while Edinburgh North and Leith lost 65 and Edinburgh East lost 45. Angus, Dundee West, Falkirk and Paisley and Renfrewshire North all lost 15 branches. Since 2015 RBS has closed the most branches, shutting 158 of the 399 banks that have closed in those three years. Bank of Scotland closed 86, Clydesdale closed 59, Santander closed 38 and TSB closed 35. Stuart Mackinnon, external affairs manager for the Federation of Small Businesses in Scotland, said the Which? research chimed with their own. He added: "Not only does the closure of a bank branch make it more difficult for businesses to access banking services, it also leaves another ugly gap on a high street or in a town centre. "For many businesses, as long as a significant share of their customers want to continue to use cash, there needs to be appropriate local financial infrastructure. "Policymakers need to take action to stop financial institutions removing this infrastructure from our communities." Bonar Bridge in Sutherland lost its bank - a branch of the Bank of Scotland - in 2017. It is now one of more than 100 communities across Scotland serviced by a mobile bank by Lloyds Banking Group, operators of the Bank of Scotland. Philip Grant, chairman of the group's Scottish executive committee, was in Bonar Bridge on Tuesday on one of his regular visits to rural locations the group offers its services to. He told BBC Scotland that technology had changed the way people "shopped, banked and even just accessed general information". Mr Grant said: "We all know there has been a huge behavioural shift in the last few years and it has affected us. "Fewer of our customers are using branches. Actually 80% of them are using alternative ways to access their banking. "We are having to respond, adjust, innovate to ensure that we can provide for all our bank customers' needs." Bonar bridge resident Michael Baird, who campaigned to save his local branch from closing, met with Mr Grant during his visit. Mr Baird he had been assured that banking through the local Post Office was now easier, and also welcomed an offer of workshops provide advice on how to stay bank online safely. But David Richardson, development manager for the Federation of Small Businesses Highlands and Islands, described the loss of bank branches as "sad". He said: "It has been happening far too much. "Eight years and 33% of banks closing, it is a sad tale and it has a massive impact on remote and rural areas." Which? also highlighted an increase in the rate of cashpoint closures - 290 in Scotland last year - as it warned of a "huge impact on communities across Scotland", particularly in rural areas. The majority of cash machines that were lost were free-to-use. In February, the watchdog urged the UK government to appoint a regulator to protect access to cash. While digital payments are rising, cash is still a necessity for more than 25 million people across the UK, according to the watchdog. A previous survey by the consumer group found that 75% of people in Scotland use cash frequently, while just 4% said they rarely use this payment method. Brian Sloan, chief executive of Age Scotland, said the "alarming" reduction in banks and free ATMs "disproportionately impacts the lives of older people" who were less likely to use digital banking. He continued: "The extraordinary push by the banks to digital services leaves behind the 500,000 people in Scotland over the age of 60 who do not use the internet. "That's the equivalent of the population of our capital city and is a staggering number of people to disenfranchise. "What's more, with an ageing population in Scotland and the projected 50% increase in people living with dementia over the next 20 years, older people will find it harder and harder to manage their finances independently if face to face banking options have been eroded to the point of extinction. "Banks must now properly explore shared banking hubs to serve the communities who have been left with no branch and to sustain a network across the country which is fit for people of all ages." An HM Treasury spokesman said decisions to open and close branches were commercial decision made by the banks themselves. But he added: "The government does not intervene in these decisions. But we understand the impact that closures can have on communities and people's jobs. "Banks must now give customers as much notice as possible when a branch is closing, and ensure they are made aware of the options they have locally to continue to access banking services."